This exhibition highlights just a small portion of a rich and unique collection that has been acquired by Fordham University Lincoln Center for our Graphic Design Archives. The material spans a period of 100 years, showing the history of the advertising, printing, paper, and typesetting industries. Many items in this collection are limited-edition printed samples of design and typography, books on typography, paper and printing techniques, typographic specimens, and books on printing and design. Charles Francis (1846–1936), who was one of the preeminent American publishers of the twentieth century and considered the “dean of the American printing industry,” began to assemble the collection in the 1880s. Mr. Francis wrote several books on printing and founded the Printers’ League of America in 1906. He dedicated his life to promoting the industry and to teaching publishing, and this extraordinary collection is a testimony to his commitment and zeal. The collection continued to grow under the stewardship of the Allied Printing Union, which was housed in the New York High School of Printing for many years. The work on display in the Lipani Gallery is a mélange of type and printing examples that illustrates the inventiveness and advancement in the advertising, design, and typesetting industry during the first half of the twentieth century. Highlighted in the exhibition are the inventive and groundbreaking magazines Upper and Lower Case (U&lc) and Westvaco Inspirations. Upper and Lower Case was created and produced by Herb Lubalin, a highly regarded iconoclastic advertising art director, type designer and publication designer for the International Typeface Corporation (ITC). 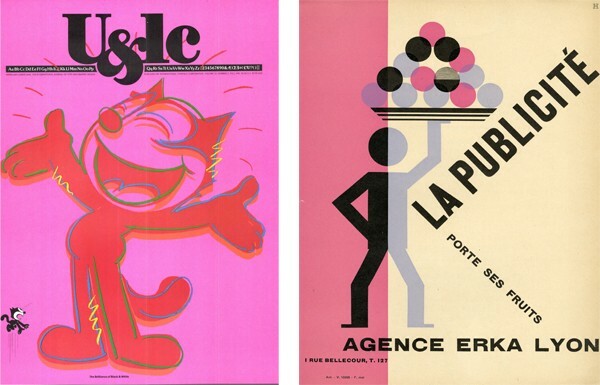 The “newspaper style” publication was targeted toward the design community. There were over 120 issues produced between 1970 and 1999. The publication promoted the latest typefaces from ITC, which was the first type foundry to exploit new photo typesetting techniques and not use traditional metal foundry type. Lubalin served as art director to U&lc for 11 years, until his death in 1981. The publication focused on showing experimental typographic compositions and was hugely successful within the design community as it shepherded in a period of new and expressive typography. Westvaco Inspirations was a graphic-arts publication issued by the Westvaco Corporation, originally called the West Virginia Pulp and Paper Company. The objective of the magazine was to demonstrate what the printing processes and its papers could produce by utilizing a variety of cutting-edge and traditional printing methods, including letterpress and offset lithography. Originally published in 1925, Westvaco Inspirations was a leading corporate contributor to the graphic-arts profession until its discontinuation in 1962. It remains unsurpassed as an example of promotional graphics, an anthology of advertising and commercial art, and, more importantly, a chronicle of a period of time in American history. Between 1939 and 1962, Bradbury Thompson designed more than sixty Westvaco Inspirations. Thompson was highly regarded for his design direction, impeccable taste and his ability to blend modernist typographic layouts with classic typefaces and historic illustrations. *Runaway Train, 1985, was based on an original screenplay by Akira Kurosawa. It is an action thriller staring Jon Voight, Eric Roberts, Rebecca De Mornay and John P. Ryan.